September pretty much ushers in the season of southward migrations. I have already noticed some gathering and flocking action among birds in my region. Certain insects, short-lived though they are, also migrate. Studies show that, like monarch butterflies, several species of dragonflies also fly south in fall, north in spring (here’s a link to a brief National Geographic post on the phenomenon). The Dragonfly Woman is one of several entomologists tracking dragonfly swarms. I recommend her site; I’ve learned a great deal about my own back yard (the insects in it) from her blog. I just witnessed a dragonfly swarm. Probably green darners, as they were large and as darners are one of the species known to swarm and to migrate. This evening, around six, I watered the remaining tomato and cucumber plants; we have had not one drop of rain in three weeks, and daytime temperatures have been consistently above 85º F. The earth beneath my feet feels like cobblestone. I try to conserve water, but there are still a few fruits on those vines and I’d love to harvest them. So I was out with the hose, enjoying the slow movement toward twilight and listening to birds and brown crickets while dousing the roots of the vegetables. In June and July, barn swallows liked to dip in and around the sprinkler at the evening garden shower. I haven’t seen them for a few weeks–perhaps they are early migrators. This evening, I looked up at a cloudless sky and saw: dragonflies, at least two dozen of them, high above the rooftop of the house and darting in wide circles over the garden and lawn. I was curious whether they’d be attracted to the water, so I directed the hose upward. I couldn’t reach them with the spray, of course, but I wondered if they would notice the droplets and be attracted to them–they are aquatic insects, after all. And due to this region’s lack of recent rain, many of the little streams and smaller ponds have dried up. Mostly I just watched them, their fast-moving, translucent wings fanning either side of their dark, elegant bodies. I tried counting them, but they’re small and quick and additional ones kept appearing from the treeline. A darner dived toward me and passed through the sprinkles, and some of its fellow migrants moved closer, tightening the circle around the vegetable garden. A spiral of fliers–some of them a smaller species–flew down and up again, playing with the stream of water. Okay, I know I’m anthropomorphizing an insect; but it was pretty startling. My husband thought so, too–he was observing the action from our back porch. The…group? flock? gathering? swarm, I guess…stayed in our back yard for about 20 minutes, then vanished. I have observed swarms like this once or twice before in my region, but the only time I witnessed a huge swarm of dragonflies was when I was a child in southern New Jersey. That time, there were hundreds, and the experience was almost frightening–awesome in the truest sense of the word. 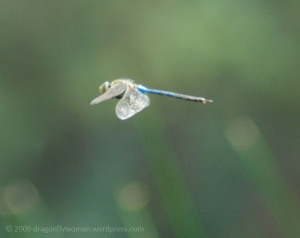 This entry was posted in Nature and Gardens and tagged dragonflies, drought, migration, swarm. A beautiful essay on the mesmerizing happenings on this great earth. We often forget that we can find beauty right in our own backyards. This was a quenching refreshment to the horrors happening right now. Thank you. I’m glad to hear it! Thanks. Magical. Sounds like a visitation and you were ready for it! So beautiful. As a weird little bit of trivia – and kind of a contrast to your experience: the Norwegian name for dragonfly could be translated by a creative soul as eye-gouger. Wow. I didn’t know that. I never saw them that way. Makes one wonder if they used to be mean in “the old days”. I live in Colorado and the entire month of June around dusk every night we had a swarm of around forty dragonflies circling our house for almost an hour a night, it was amazing. I have never experienced this before. I was a teenager in the back seat of a car reading a comic, parked on a dirt road, by a birch tree forest, swampy area. All of a sudden a few blue dragon flies came from the swamp followed by a blue cloud, thousands, all flying by, over and around the car all going in the same direction, towards the brook. I never saw anything like it and I certainly will never forget it. I’m almost 70 now. Thank you for your story, i was mesmerized by it. Thanks so much for sharing your experience! That was definitely a “swarm”–and the sight is indeed mesmerizing.